“The muscles that help you stand and extend—such as the spinal erectors, glutes, and mid traps—aren’t used when you’re sitting, so over time they weaken,” says Justin Jacobs, Tier X manager at Equinox St. James in London. The exercises below train the posterior chain, which houses the glutes, hamstrings, and lats. Strengthening this group of muscles can reverse the damage of sitting and promote better posture. Perform the workout below 2 to 3 times per week for best results. Stand with feet wide, toes turned slightly out, and hold the center of a barbell with hands shoulder-width apart, palms facing thighs. Bend knees slightly and keep back straight as you bend forward from hips until back is nearly parallel to the floor, lowering bar toward the floor. Rise up to starting position. Do 4 sets of 6 to 8 reps. Stand facing a sled and hold a handle in each hand with arms extended 45 degrees in front of you, hands at hip-height and palms facing each other. (Ropes should be taut.) Bend knees and hinge forward from your hips, then bend elbows straight back, drawing your hands toward your waist. Extend arms, rise up, and step back until ropes are taut again to return to start. Do 3 sets of 8 to 10 reps.
Place a kettlebell of moderate weight on the floor to the outside of your left heel with your foot directly behind the kettlebell. (Your weight is on your right foot.) Maintain a straight line from the top of your head to your left heel. Push the left foot straight back off the floor and hinge forward over your right leg until you grasp the handle of the kettlebell with your left hand. Ideally, you finish with your spine and leg parallel to the floor. Drive the right heel into the floor to stand all the way up with a long spine. Repeat to bring the bell back down to the floor, then stand again with the bell. Do 8 to 10 reps, then repeat on the opposite side. Do 2 to 3 sets. Begin in a low squat facing the band, holding it with both hands, arms fully extended and palms facing each other. Take four steps backward, then pull the band backwards while squeezing your shoulder blades together. Then, take four steps forward to complete one rep. Do 3 sets of 10 to 12 reps. Stand with feet a few inches apart, resistance band wrapped around ankles, knees slightly bent, hands on hips. Keeping both knees bent, take a small step forward with your left foot, then back to center. Step out to left, then back to center. Step behind you, then back to center. Do 3 reps, then switch directions (stepping back, then out to side, then forward) and repeat. Switch legs and repeat sequence. Do 3 sets per side. Stand with feet hip-width apart, a kettlebell next to both feet on the floor. Squat down to grab the bells, then stand up, holding a kettlebell in each hand, arms extended at your sides, and palms facing your body. Walk forward, turning around whenever you run out of space. When fatigued, but before form falters, squat back down to return to start. Do 3 sets. 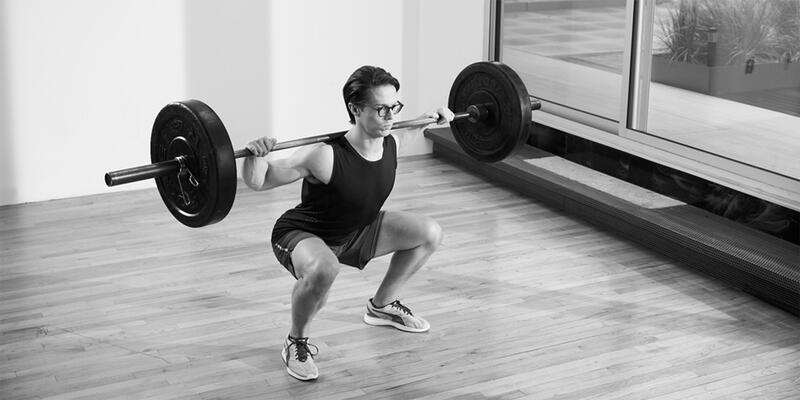 Can you pass the squat test?